So now we are about to start the new race season I would like to thank Carvalho custom for agreeing to sponsor me for custom race kit for the 2014. Carvalho Custom is based in Portugal and is one of Europe’s leading suppliers of custom cycling and triathlon clothing and other team sports kit. Having raced in Carvalho kit last year I am very happy that are they are supporting me in the 2014 race season as I am already comfortable with the quality and performance of their kit and I’m very excited to have been working with them on the design of my new kit in the last few months. I would like to thank Sport Pursuit for supporting me with most of my kit requirements last year and having helped me out with trainers, wetsuits, bike equipment and kit etc for the coming year… however, as Sports pursuit are taking a different direction with sponsorship for the new season I was grateful of the offer from Carvalho to work with them for the 2014 season. 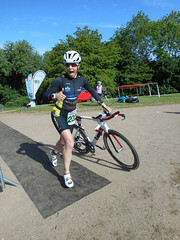 That now completes my sponsorship for 2014, Azione for a great race bike and cycling support, Advanced Tri Fuel for my nutritional requirements. Back on track physio continues to support me by providing regular sports massage and lots of useful physio and injury prevention advice and now to complete that package I have my kit coming from Carvalho. So excited for the coming season……..
A couple of weeks ago I received an email from Martin at TFN inviting me to an open day at the shop and to have a complimentary bike fit from SpeedHub. Having had a Retul bike fit transform my riding on my training bike last year, I jumped at the chance to accept this offer as I’ve recently had some changes made to my race bike including a new Adamo attack saddle and wanted to ensure I was going to be racing in a fully aero but sustainable position. My new race bike – not seen the light of day yet with such a bad winter! I got to the shop just before noon on saturday and had a nice chat with Martin and he introduced me to the owner of the shop Mark Redwood. Mark told me a little about the history of TFN, which as a relative newbie to triathlon still I found it very interesting. TFN opened its doors for the first time in April of 1996, started by 4 like minded friends who had struggled to find anywhere to buy their triathlon kit all in one place. The original premises in Nottingham were small but as the years went on TFN steadily grew and what had started as more of a hobby became a serious business. In 1999 TFN were one of the first shops to get a dedicated e-commerce website. In 2001 they moved to the current Beeston location. 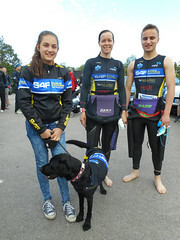 The TFN race team has been influential in local and national races for years, TFN have previously supported up and coming triathletes and over the years such huge names as Jodie Swallow, Andy Tarry and Tom & David Bishop have started their careers with TFN. They have won numerous national titles over the years and intend to keep us this standard. The whole team and TFN were very friendly and helpful during the day and mid way through the afternoon it was my turn for a full Retul bike fit with Tim from Speedhub. The retul bike fits takes many measurements using little LED style tags on your body and a camera type gadget to pick up the signals, this paired with Tims experienced eye and knowledge of both road / TT and triathlon riding can give you the best fit for both aerodynamics but also, and more importantly for me, something that is sustainable for the ironman distances I will be covering. I about to set off to La Santa for a training week on my race bike, and Tim has kindly offered for me to have a follow up fit after I’ve put some serious miles in to get a feel for the new more aggressive position will be in on my race bike. If you have haven’t already checked out the website for TFN i can highly recommend you do so, and if you live locally, its well worth a visit, they have a huge amount of stock in store to browse and its much as ordering on online is convenient, when it comes to things like wetsuits you cant beat going into a store and trying a load on. Check out the website for brands and models…. Thanks to Mark and his team for a great day! So this weekend was my second 24hr MTB event. The first one of these I did several years ago was based in the midlands during the peak of summer – very different to what I experienced this weekend! The Strathpuffer started in 2005 – it was meant to be a one off local event but somehow nine years later we have a national event with a legendary status. Over the years we have had every possible type of weather conditions – gales that blew away our marquee, iced roads, 2ft of snow the week before the event, temperatures down to minus 10 degrees, rain, hail and even sunshine . . . . you get the picture but then if we insist on staging a 24 hour event in the Highlands of Scotland in the middle of winter what do we expect? We now attract competitors from all over the world – probably because we were included in the US Bike magazines top 10 toughest Mountain Bike events on the planet – and we are widely recognised as the event every decent mountain biker needs on his palmares. My brother lives only a few miles from the race venue so he knows the forest and the trails really well, I’ve ridden part of the puffer trail a couple of times over the last few years but I’ve ran it more often than I’ve ridden it. My brother and his friends went to pitch the tent and park the transit van (my personal changing room!) on Friday afternoon and then we all went along at 8am on Saturday morning to set up and get ready to race. We had a tent with a stove and a gazebo with bike maintenance stand etc for repairs and brake pad changes etc. Burt was to take the first lap, then myself, Leigh then finally my brother and the plan was to keep this order for the 24hr period. The weather was great – for the highlands, first couple of laps were still quite icy but the trails thawed during the day, but the rain started so it got very muddy. The format of the race means there is 17hrs of darkness – and i haven’t done much night riding at all so I knew my dark laps would be a lot slower. First lap done – the smiles say it all! My first lap was a 47min, followed by 50mins, 56mins (first one with lights), 57mins, 59mins and a 63mins for my final lap at 4:30am by which point i think i was seeing double and imagining all sorts in the dark….during my 6th lap it was obvious that time wise we would have time for 3 of the members to do a 7th lap – as the only female member, i kindly offered my 7th lap to my brother as he would missed a final lap if i had gone out for my 7th – i pretended i was doing this as i knew he would never hear the end of it if he was the only lad not to do a 7th but in truth i was worried i would have a bad crash if i did another one as i was having all kinds of silly mistakes on my last lap, and my self preservation kicked in! Our teams fastest lap was a 40mins put in my brother, a very respectable lap time. Me and my brother – thanks for asking me to join your team Michael. Overall we placed 40th mixed quad team out of 85 – not bad for a mixed ability team doing it for fun. Congratulations due to my sister in law who took part in an all female team, they placed 2nd out of 4 female teams so came home with some goodies too! Well done Kate and team. Lady and the Saddle Tramps – placed 40th! The whole weekend was amazing and i can highly recommend these 24h events – great fun if you can survive 24hrs of no sleep whilst doing a fairly technical MTB 7miler at regular intervals – certainly redefined ‘interval’ training for me! I am pleased to announce I will be partnered with Race Force for the coming race season. Azione Carbon Cycles will be at the cycle show all weekend at Birmingham NEC. Please take a look and let me know what you think! My feet were killing me from after around 60 miles, so I’ve bought some new cycle shoes a size larger. I think the extra warm weather and swollen feet were responsible for the pain I experienced, still the pain in my feet took away from the pain in my legs, so I felt ok when I finished the ride and put my lovely comfy running shoes on! The rest of the week was quite low impact and low on hours really, but then I had my final big day this Sunday, which was a race rehearsal. 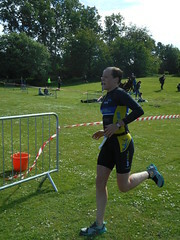 After a 4am wake up call, my friend dropped me off at Datchet water for a 1 hour swim and then on to T1 at the car and off on a 54 mile around the lovely lanes of Bucks/Herts, ending up at home for T2 and brick session – a painful one at that – 40min run with 30sec pick ups! Tapering this week means 2 full days of rest, so I’m now twiddling my thumbs and wasting time on the laptop searching for my new race bike for next season – I’m actually tempted to buy my race wheels now so I can get use of them on my current bike at Bolton; everyone keeps telling me the wheels are what makes the most difference, so it couldn’t hurt to put them on the bike I have and then have them ready to go when I buy the new bike in the coming months….